For dividend investors not wanting to micromanage their portfolios, these stocks are good bets. For long-term dividend investors, the best type of stock is one that can be bought and largely forgotten about, with the occasional checkup to make sure those dividend checks aren't in danger. A few of the Fool's contributors have identified four high-yield dividend stocks that fit this description. Here's why Microsoft (NASDAQ:MSFT), Vanguard High Dividend Yield ETF (NYSEMKT:VYM), ONEOK (NYSE:OKE), and Enterprise Products Partners (NYSE:EPD) are great buy-and-hold dividend stocks. Tim Green (Microsoft): Being a technology company, Microsoft is more susceptible to disruption than other dividend-paying stalwarts. But it's not a company that investors need to worry too much about. Under the leadership of CEO Satya Nadella, Microsoft has shed its image as a tech dinosaur and aggressively embraced cloud computing. Microsoft's stranglehold on the productivity software market remains intact, its cloud-computing platform is a strong No. 2 player, and innovations like the HoloLens augmented reality headset could put Microsoft right at the center of the next computing revolution. Microsoft's dividend, currently yielding about 2.4%, isn't all that high. But it's superior to that of the average yield of stocks in the S&P 500, which yields less than 2%. Microsoft produces an incredible amount of free cash flow -- nearly $25 billion in fiscal 2016. This fueled not only $11 billion in dividend payments, putting the payout ratio at about 44%, but also $16 billion of share buybacks. There's still plenty of room to grow the dividend going forward, even without much earnings growth. Microsoft's cash-rich balance sheet is another reason the stock is attractive to dividend investors aiming to buy and hold for many years. Microsoft had net cash of $37.8 billion at the end of the latest quarter, providing a massive cushion that can sustain the dividend even in the roughest economic conditions. While there are higher-yielding stocks available, Microsoft is a good option for long-term investors. Brian Feroldi (Vanguard High Dividend Yield ETF): It is natural for income-focused investors to want to own stocks that offer up higher yields than the market in general. However, picking the right high-yield stocks can be tricky, since a massive payout can sometimes actually be a warning sign. One alternative that is available to all investors is to instead invest in an exchange-traded fund (ETF) that is focused on dividend stocks with above-average yields. If that sounds like a smart way to go, then I'd suggest that you give the Vanguard High Dividend Yield ETF a closer look. This passively managed ETF owns more than 400 stocks that have higher yields than the market in general. Its biggest holdings are all names that investors are familiar with -- think Microsoft, ExxonMobil, Johnson & Johnson -- which also provides investors with an extra layer of stability. 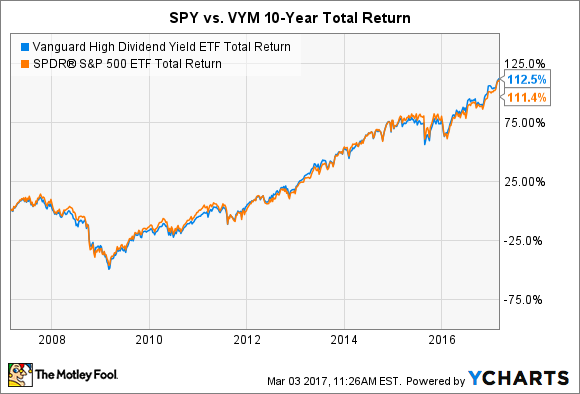 The VYM currently offers a dividend yield of 3%, which is more than 50% higher than that of the S&P 500 average yield. Better yet, this fund's 10-year total return -- which accounts for the reinvestment of dividends -- is neck and neck with the S&P 500. Despite all of its benefits, Vanguard only charges a minuscule 0.08% expense ratio to access this ETF. Thus, if you are after a high yield but don't want to pick individual stocks, the Vanguard High Dividend Yield ETF could be an excellent choice for you. Dan Caplinger (ONEOK): The plunge in energy prices in 2015 hurt companies throughout the industry, and even midstream infrastructure plays like ONEOK took big hits in their share prices. Yet after losing 70% of its share price, ONEOK has surged in the past year, nearly tripling as investors have figured out that not all companies have the same exposure to crude oil prices as others. ONEOK has an impressive slate of infrastructure assets, helping in the gathering process of natural gas from the Permian Basin, Rocky Mountain, and Mid-Continent regions of the U.S. and then processing, storing, and transporting it to key market centers in the energy industry. That business relies more on production volume than on price, and although the producers that ONEOK works with transport more natural gas when prices are favorable, the energy transportation giant has still been able to produce solid results as oil and natural gas prices have rebounded. ONEOK currently has a yield of 4.5%, but that figure should go up when the company completes its planned acquisition of its ONEOK Partners (NYSE:OKS) master limited partnership. Once the MLP deal is complete, ONEOK expects to boost dividends by a fifth, which should help the yield even further. As long as energy prices remain strong enough to induce its clients to send natural gas through its infrastructure network, ONEOK will be in position to keep delivering income to its investors. Matt DiLallo (Enterprise Products Partners): Pipeline giant Enterprise Products Partners has an excellent track record of paying investors an above-average dividend. In fact, since going public in 1998, the company has raised its payout 59 times, including in each of the past 50 quarters. These haven't been token increases, either, with its last payout representing a 5.1% raise over the prior year. All these increases have added up over the years, with the company currently yielding a very generous 5.8%. That payout is about as safe as they come. First of all, more than 85% of Enterprise's cash flow comes from fee-based service contracts, which provides it with very stable cash flow. Furthermore, the company pays out less than 80% of its cash flow, which is well below the near-100% payout ratios of the average MLP. Finally, the company has a top-notch balance sheet, evidenced by the fact it has one of the highest credit ratings among MLPs. Add it up, and Enterprise has the financial strength to maintain its distribution rather easily. That said, the company is more likely to maintain its distribution growth streak than simply keep things status quo. Fueling that growth potential is the fact that it has $6.7 billion of growth projects under construction and several additional projects under development. These new assets should enable the company to continue growing its cash flow, giving it more money to return to investors. Needless to say, this is one dividend stock that will not cause investors any worry.